Indian medical system is expected to see some welcome changes which were long overdue, towards improving the quality of medical practitioners in the country. This was evident from the decision taken by Union Ministry of Health and Medical Council of India (MCI), to conduct an “Exit Exam” for all MBBS students, irrespective whether they have done their medical education from Government or private medical colleges. The Proposed exit exam will be conducted every year. Though optional initially, this exam will become mandatory for doctors wishing to practice in India. Clearing the exit exam will make the candidate eligible to practice anywhere in the Country, unlike the current practice where at present; Doctors register themselves with the state chapter of Medical Council of India (MCI) and get their registration transferred if they intend to practice in another state. The exam will be even more crucial as Students not passing the exit exam, could even be held back from post-graduate studies. The draft proposal as drawn up by the ministry intends to use the current Foreign Medical Graduate Examination (FMGE) as a voluntary exit examination for all MBBS Doctors, whereas till now FMGE was only mandatory for Indian candidates who had acquired medical degrees from foreign countries. With the introduction of a common exam as a yard stick for all MBBS doctors both Indian and foreign educated, the number of students embarking on medicine studies to western European and South east Asian countries is going to witness steady increase owing to their world class quality education, worldwide acceptability of degrees, excellent infrastructure, practical nature of training offered, affordability factor etc to mention a few. 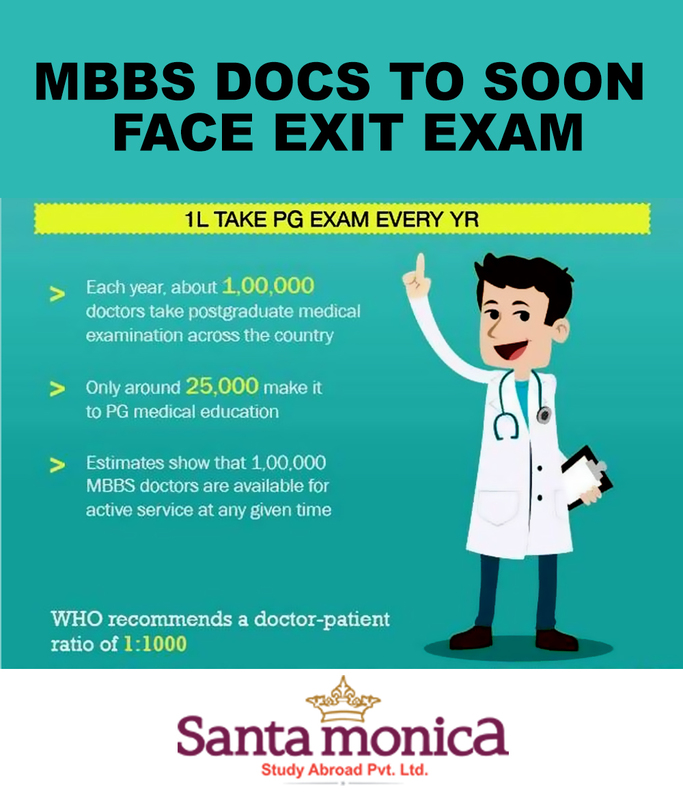 Santa Monica medicine studies has been working closely with well established medical institutions with world class facilities in western, European and Southeast Asian countries, offering internationally recognized medicine degrees in English medium and can surely help you identify your best option. The team at Santa Monica has personally visited the institutions and have assessed their facilities and interacted with students before facilitating admissions to these associated institutions. For more details, please seek the advice of our experts in choosing the right destination for your medicine studies. For more info contact us on 0484-4140999. This entry was posted in MBBS exit exam and tagged Exit exam on February 16, 2016 by Ronnie Fredrick Thimothy.